Personality: The Snorkie has a wonderful disposition. They are happy go lucky dog who are very intelligent. They love to play and do tricks and they love to learn new tricks. They are awesome family dogs. Family Dog: Snorkies make great family pets. They are great with children and other animals. Shedding: The Snorkie is a very low to no shed dog. Grooming: Snorkies do require regular grooming. They are typically given a puppy cut even when they get older. It keeps them looking nice and is easy to keep up. Training: The Snorkie is very eager to learn and please their owner and as such can be taught many commands. Behavior: Snorkies are very sweet, fun-loving dogs who behave quite well and love people. They can be stubborn at times. Barking: Snorkies are average barkers. They especially like to bark when playing. Weather: The Snorkie can do well in either warm or cold climates but are not typically fond of very hot weather. Exercise: The Snorkie loves to go for walk and play. Living Conditions: Snorkies are great dogs for a home or apartment. 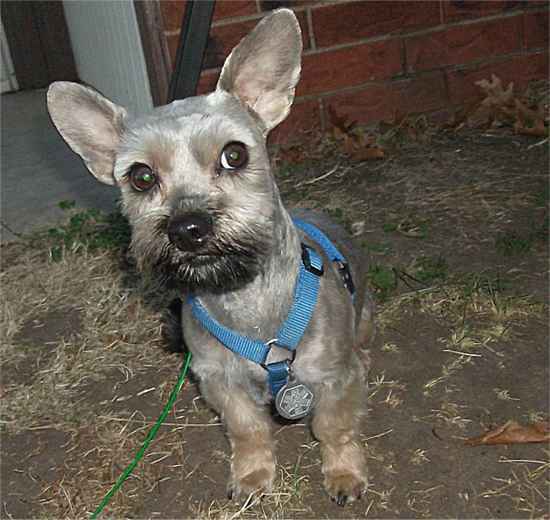 Appearance: The Snorkie has the build of a Schnauzer with the appearance of a Yorkie. They always have the markings of either the Yorkie or a solid color coat like the Miniature Schnauzer. Size: Snorkies are small dogs ranging from 5 to 12 pounds when fully grown. Companionship: Snorkies are very loving dogs who love to be with you at all times. Head: The head of the Snorkie is usually more blocky like the Schnauzer's. Ears: The Snorkie can have small floppy ears. Body: Snorkies can have a thin or stocky build. Feet: The Snorkie has small feet. Tail: The tail of the Snorkie can be docked or left natural. Color: Snorkies typically have a black and tan coat similar to that of the Yorkie's and may have some gray mixed in. They can have a solid color coat like a Schnauzer's or a multi-colored coat. Coat: The coat of the Snorkie is usually silky resembling that of the Yorkie but sometimes it can be a mix of the two. Life Expectancy: The average life expectancy of the Snorkie is 15 years. Characteristics: The Snorkie is a fun loving who loves play and do tricks. Allergies: The Snorkie has no known allergies at this time. Health: The Snorkie is a very health mix with no known problems at this time. Bone Health: The Snorkie has very healthy bone and muscle mass. Litter Size: The average litter size of the Snorkie is 5 to 10 pups.